Sometimes, Boyfriend and I like to put on some music, have a glass of wine... and play Scrabble. Boyfriend isn't the best to play Scrabble with -- he is all about the tiny words that fit in with other words, getting lots of bang for their buck. This strategy completely closes off the board and makes it very difficult for other plays to put words down. Boyfriend will also get crabby if he starts to lose and will sit, sometimes for 20 minutes, trying to find the perfect word to play. You know who else isn't the best to play Scrabble with? Kitten. Kitten is illiterate and it really seems to irk him when the literate members of the house decided to play games that involve words. 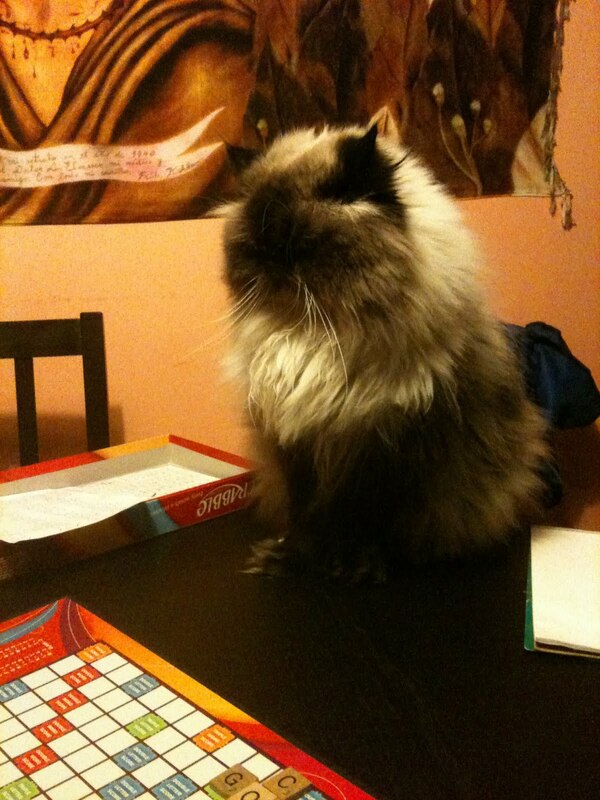 The last time Boyfriend and I played Scrabble, Kitten decided to join us on the table. At first he sat beside the board, but slowly -- ever so slowly -- he inched his way over, and on to, to the board. Kitten had had enough of our book learnin' and wiped off the entire top of the board. Luckily I had taken so many pictures prior to this moment, that we were able to reconstruct everything. From then on, Kitten was scolded any time he got too close. He wasn't too happy about it. POTTY TRAINING UPDATE: Boyfriend and I took a trip to Ottawa last weekend, which meant that the potty training had to be put on hold. Since the training litter needs to be cleaned constantly, we had to put down an actual litter box for the time we were gone. It took me a few days to get the training one set back up after we returned, so basically there is nothing new to say about the potty training, except I am expecting some regression in the days to come. Cats are so annoying. My one cat does the same thing whenever we bust out the Scrabble. I am totally buying that kit. It is potty training time.